SHOUT is an original, one-of-a-kind book with over 70 pieces of stunning art and words of wisdom from 90 intellectually and physically challenged youth. These artists and writers reveal a true-to-life glimpse into their lives, hopes, dreams and even their frustrations and disappointments. These young people face more in life than most of us can ever imagine. Besides the pure joy of it, there are big loud reasons to read this book and share it with your children, teachers and principals: learn how to respect and interact with differently abled people by gaining a deeper understanding of their lives; understand the many challenges others go through in a life via a comprehensive glossary of illnesses; read the simple and specific details on how to set up and run a Buddy Program (pairing able bodied and differently abled children) at your school; gain the understanding and courage to shout "Hello" to someone you may have avoided before, and start an awesome new friendship. The book contains a curriculum for a year-long Buddy Program that can be implemented in any K-12 school and gives current statistics on how harmful bullying can be in a school or any other environment. 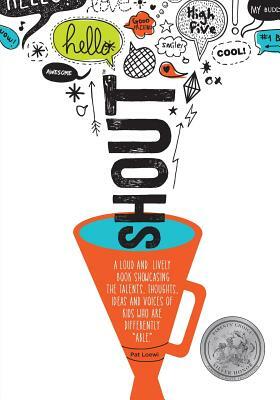 SHOUT will not only raise your spirits, it will make you want to raise your voice and share in the celebrations, triumphs and tough challenges of these children and young adults.